Please find attached the UNISON MoneyTalk Newsletter – New Tax Year, the personal finance newsletter for members of UNISON published by Lighthouse Financial Advice. Eastern, Midlands, North West, North Wales, East/South/West Yorks. In UNISON, ‘Black’ – with a capital B – is used to indicate people with a shared history. ‘Black’ is used in a broad political and inclusive sense to describe people in the UK who have suffered from colonialism and enslavement in the past and continue to experience racism and diminished opportunities in today’s society. 1.North West Regional Black Members Meeting, 1 pm to 3 pm, Wednesday 1st of May at GHS Enterprise Ltd, South Meadow Lane, Preston, PR1 8JN. 2. 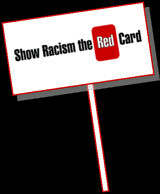 Black Members Training Day, Wednesday 22nd of May, Venue tbc. This is a fantastic opportunity to develop your understanding of how to get involved in Unison, tackling discrimination at work , race and trade unions and developing Black leaders. 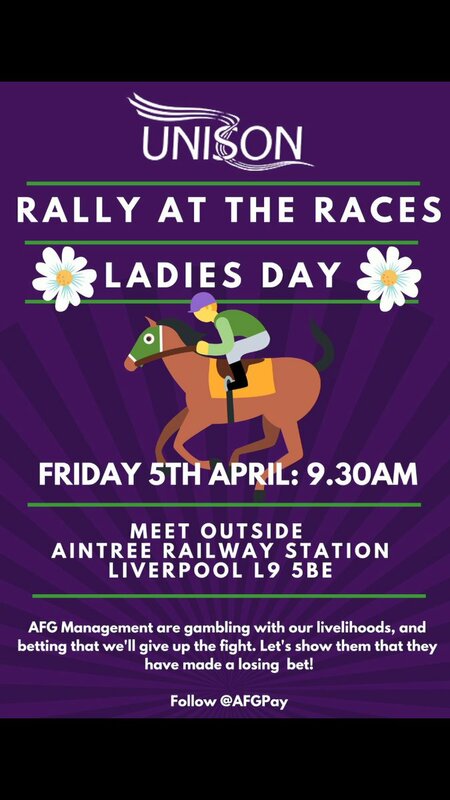 Please put this in your diary and registration details will be sent out in due course. 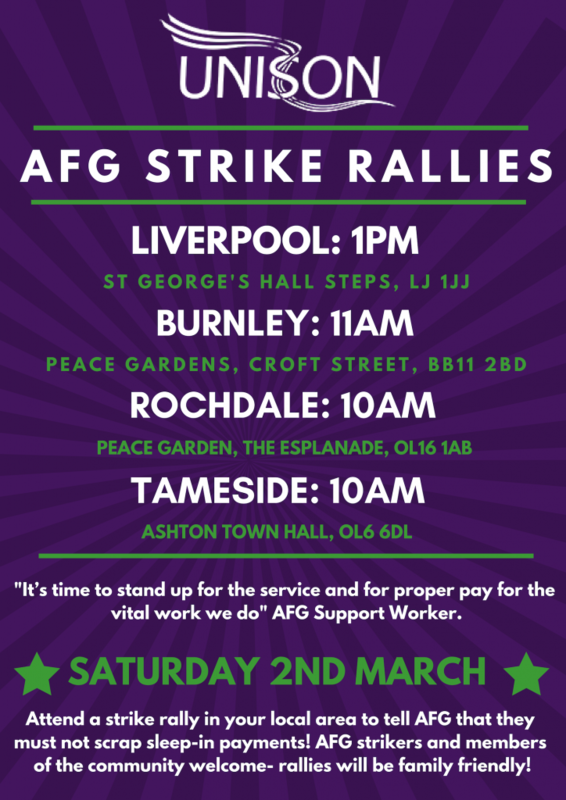 We are mobilising dozens (perhaps hundreds) of members and activists from across the region to help campaign to unseat Tory MP David Morris, and hope the you can promote this event to Unison members across the North West (or anywhere within a reasonable driving distance) – and help get our candidate Lizzi Collinge, elected in Morecambe and Lunesdale. There will be speeches from Shadow Cabinet members Andrew Gwynne MP and Mike Amesbury MP, plentiful refreshments and opportunities to go out and do some campaigning on the doorstep. David Morris has his head in the sand over the level of poverty in Morecambe and has publicly denied there is an issue. The area needs an MP who listens to their needs instead of claiming the roll out of Universal Credit has been a huge success. 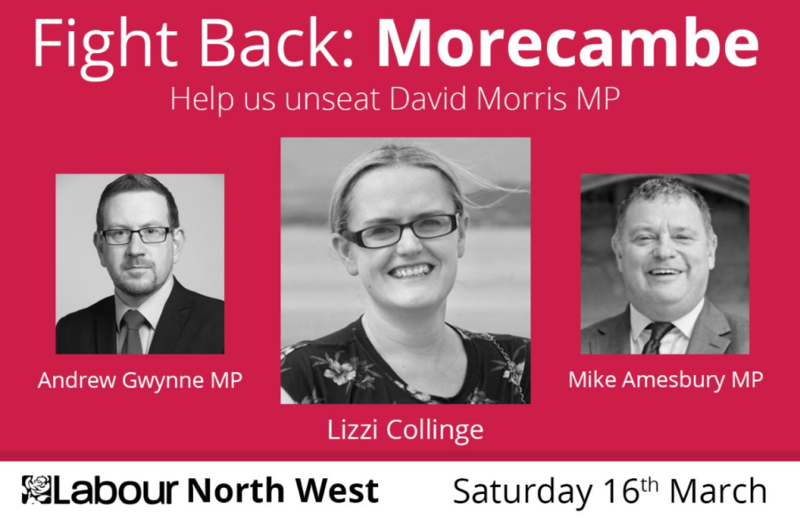 Come and help us get rid of Morris and make Lizzi the MP! 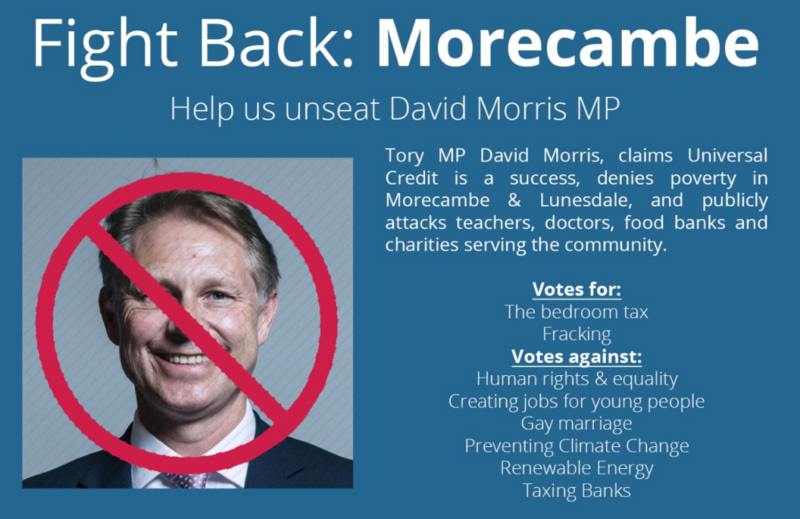 We hope Unison can join with us to send a powerful message – David Morris does not represent the people of Morecambe & Lunesdale and its time for him to go! Your members can let us know they are coming by RSVPing on our website, or on our regions Facebook event – and can share with other members, activists and supporters in the North West! It has been another busy year for us all and it doesn’t seem 2 minutes since the last AGM. This year the branch has attempted to open up the AGM to be more available to more members therefore we have decided to hold aggregate AGM’s – dates and venues below. We really hope that you will be able to make it to one convenient for you, be it home or work. Please could you complete the attached slip so we know whether you are attending or not, then we can order enough food for us all! As we are undertaking meetings in different areas we have no guest speakers , however we are opening the floor to you, have you got any suggestions on how you want the branch to communicate with you?? We are looking into using social media, what would you prefer?? WhatsApp group, Facebook Pages, Tweets, email, post or text – there is no right answer but we want to be able to reach everyone – what are your thoughts?? Come and meet us and let us know what you think, we will also have the usual freebies for you to collect. We look forward to seeing at one of the above events. 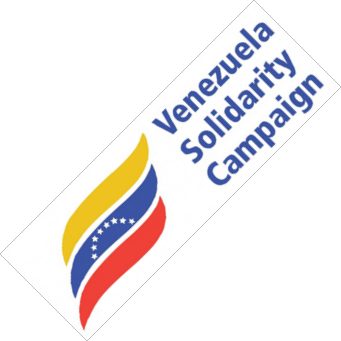 The event is being jointly organised by UNISON North West and the Venezuela Solidarity Campaign, to which the union is affiliated. UNISON has called on the government to promote dialogue to foster a peaceful solution to the Venezuelan crisis, instead of stoking tensions. The UK has joined a number of countries, including Germany, France, Spain, the US, Canada and several Latin American countries, in endorsing Juan Guaidó, Venezuelan opposition leader and president of the national assembly, who has declared himself interim president of Venezuela. UNISON is concerned at the escalation of international interference, including the possibility of military intervention, in the internal affairs of a sovereign nation. The union vehemently rejects a militarised solution to this crisis; the people of Latin America have not forgotten the history of US-backed military rule in the region. UNISON believes that Venezuelans need to resolve their differences through constructive dialogue and democratic processes, without resorting to violence. International intervention risks intensifying existing political divisions and inflaming tensions that are the consequence of the severe social and economic crisis facing the country.